Yesterday I had a lovely day trip up to New Hampshire and Maine. My first stop was to meet my photographer Michael J. Lee to scout a recently completed project near Exeter, NH. Then I headed off to Maine to visit the York Decorator Show House. This is the 24th show house benefiting the Museums of Old York and each year thousands of people make the trip. The Museums of Old York maintain nine historic house-museums, collections and provide educational opportunities to thousands of school children each year. 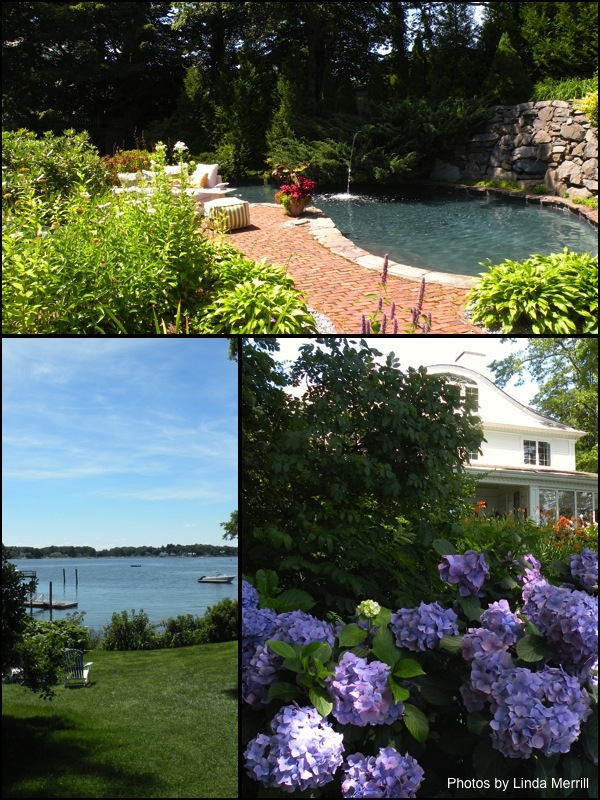 This year’s show house is on Kittery Point, ME with amazing water views over to New Castle, NH. The house was built in 1996 in a sort of “Contemporary Federal” style. It was built into the hill the rolls down to the water and has six levels to accommodate the landscape. The street side of the house is pretty unremarkable but from inside you’d never know there was a busy street nearby. The “show” is definitely the back of the house which faces the water. 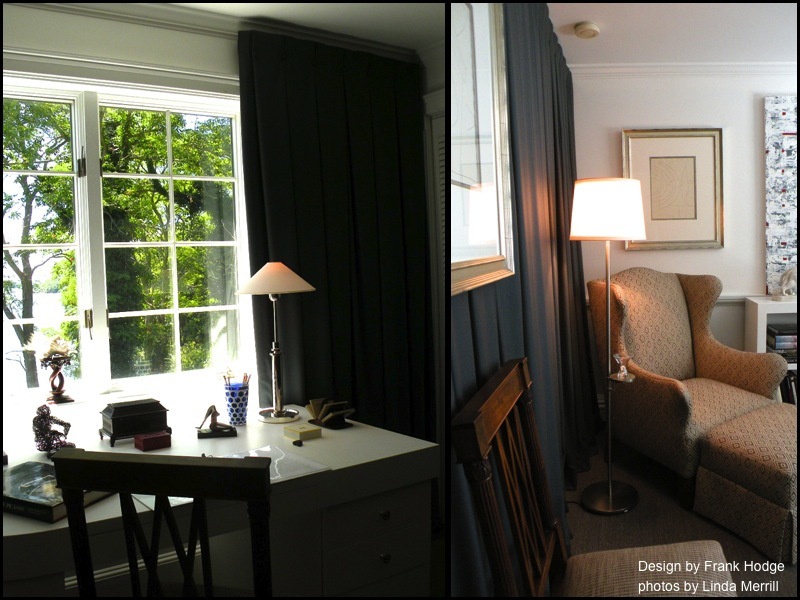 This year’s group of designers included several of my New England design and blogging buddies and it was a lot of fun to visit their spaces. Below I’m sharing some of the 100 photos I took yesterday! Needless to say, I couldn’t share them all, but tried to pick the highlights. Barbara Elza Hirsch was with me on the BlogTour trip to New Orleans and the Brizo Blogger19 trip to Memphis. 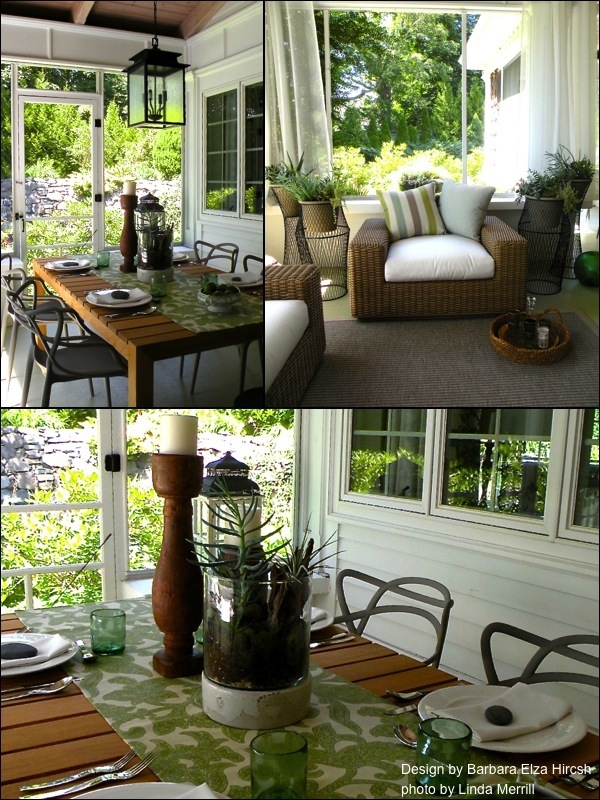 I love her screen porch – the shapes and textures are unique and yet the whole is perfectly integrated into the landscape beyond the screens. Yvonne Blacker is a long time blogging buddy. She works for Designer Bath in Salem and put together two stylish and sophisticated bathrooms filled with gorgeous fixtures. A fellow member of the Brizo Blogger 19 (she was in Memphis too! 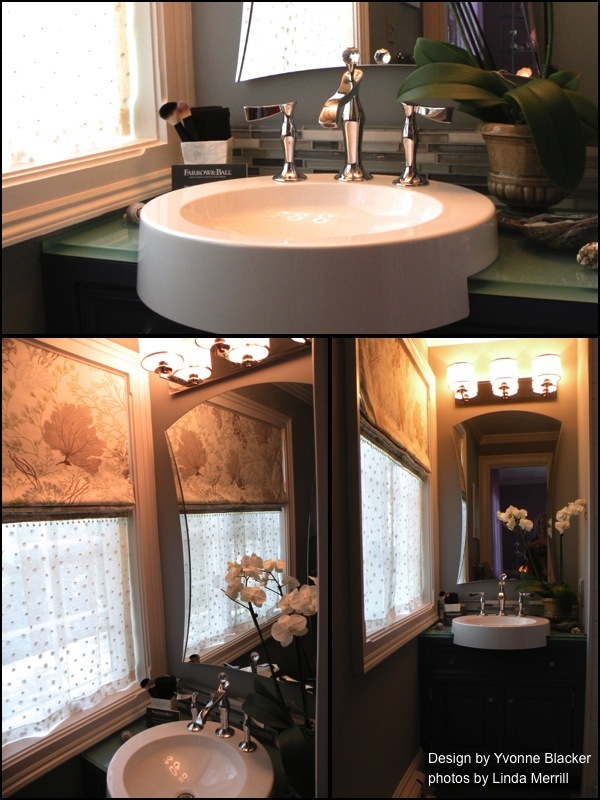 ), Yvonne of course used some gorgeous Brizo fixtures. The top bathroom features their RSVP Collection. The bottom features fixtures from Jason Wu for Brizo. 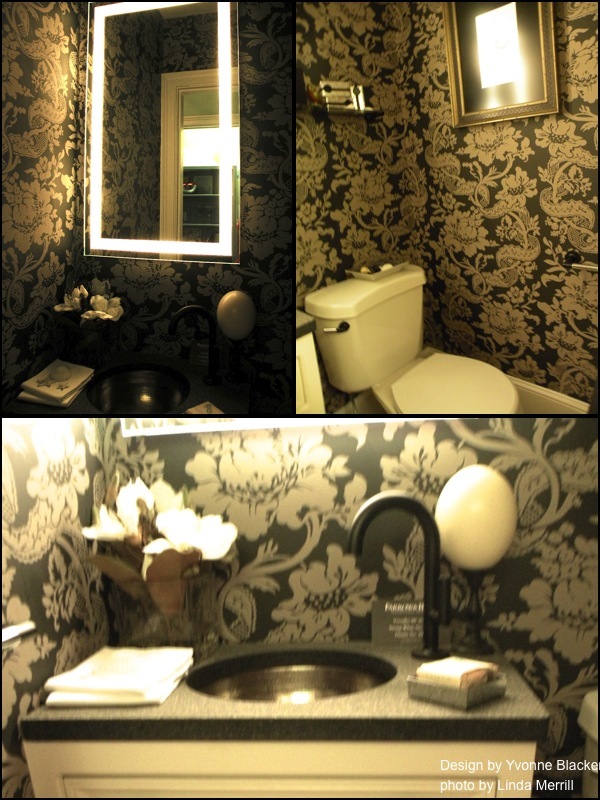 Apologies to Yvonne – these photos didn’t come out well – the only light available in this bathroom came from the gorgeous lighted mirror that she installed. Designer Meredith Bohn designed several rooms including the kitchen, dining room, sitting room (featured above) and a ladies retreat. 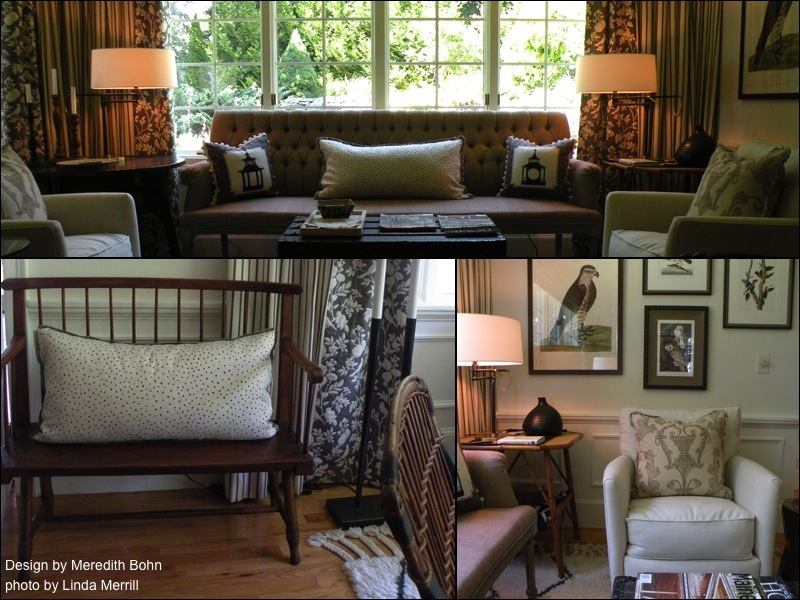 She integrated a mix of antiques along with comfy upholstered pieces, Audubon prints and stylish accessories. 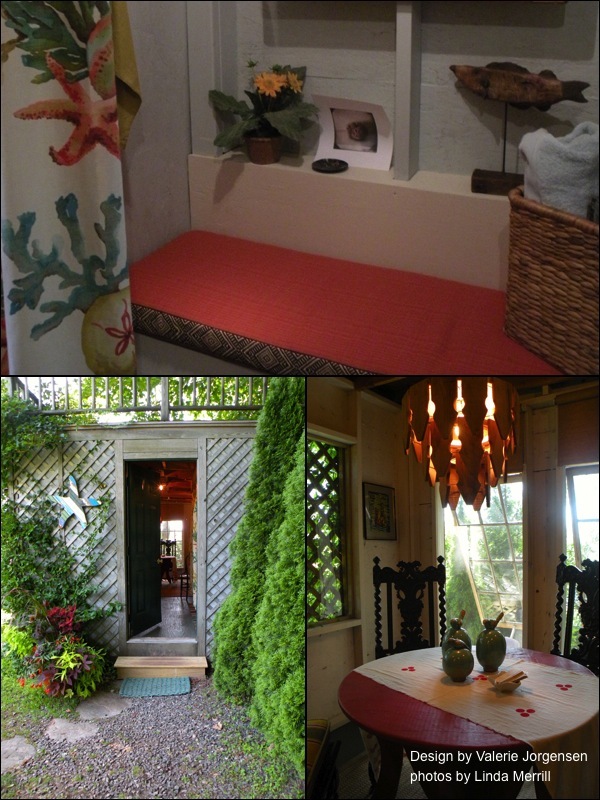 A standout space for me was the private Guest Cottage designed by Anne Cowenhoven. I guess I just love pink and green! 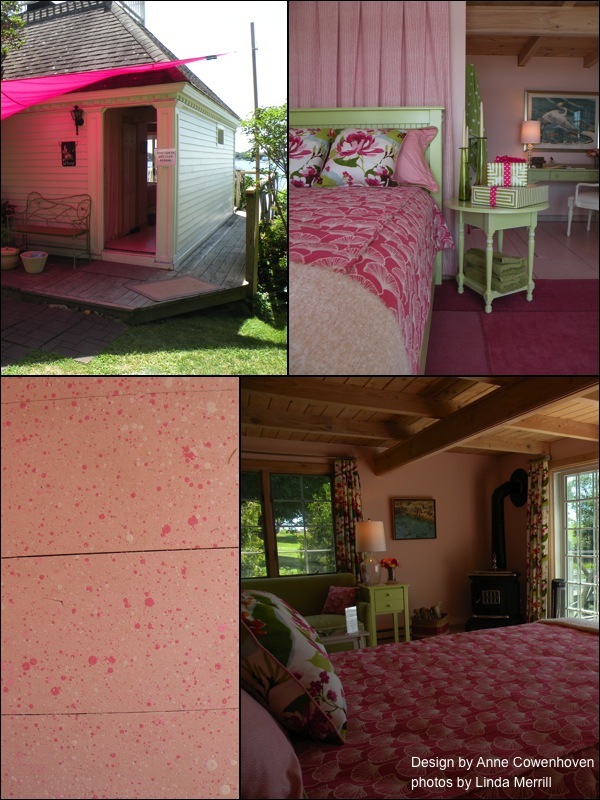 She installed a bright pink sail over the entrance which made the interiors just glow. The floor was splattered with pink paint and the textiles are just gorgeous. Feminine and girly, but not babyish. Designer Frank Hodge created a masculine study which has spectacular views – hard to imagine getting any work done. Again, apologies for the poor photography – it’s hard to balance the bright light coming in from the outside against the darker interior palette. The space is cool and a nice respite from the brightness all around. Designer Valerie Jorgensen decided that an old tool shed on the property would be a fun challenge and she turned it into a cabana of sorts with sitting area and changing rooms. Valerie also decorated around the pool area (shown at the bottom of this post). She decided to make this a truly eclectic space, as if everything was found in the attic and used in the space “as is” – and it works! She used fence pickets as a continuing theme in the space, including the custom chandelier that her intern made for over the table. 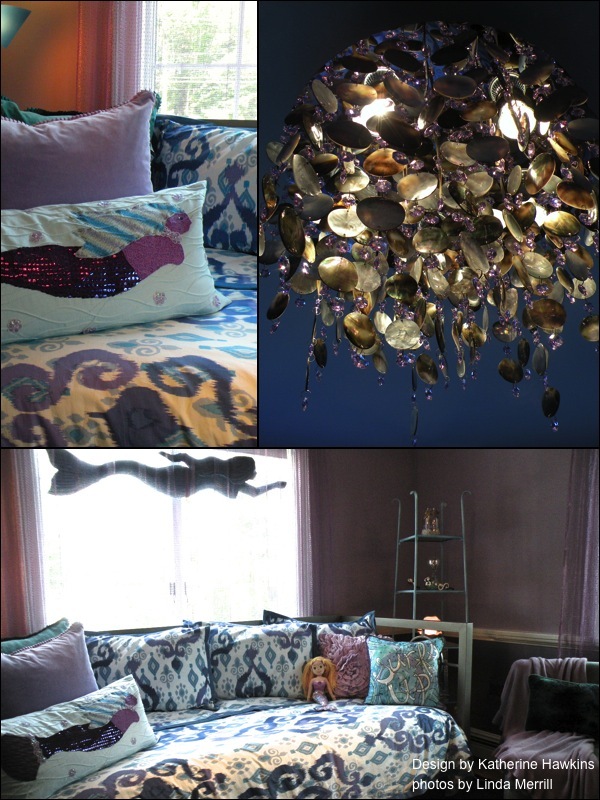 New England blogger and design friend Katherine Hawkins created a teenage girl’s hangout space that features a vibrant purple, pink and teal color palette with a mermaid theme. The standout is the gorgeous crystal and shell chandelier which came from Lucia Lighting & Design. 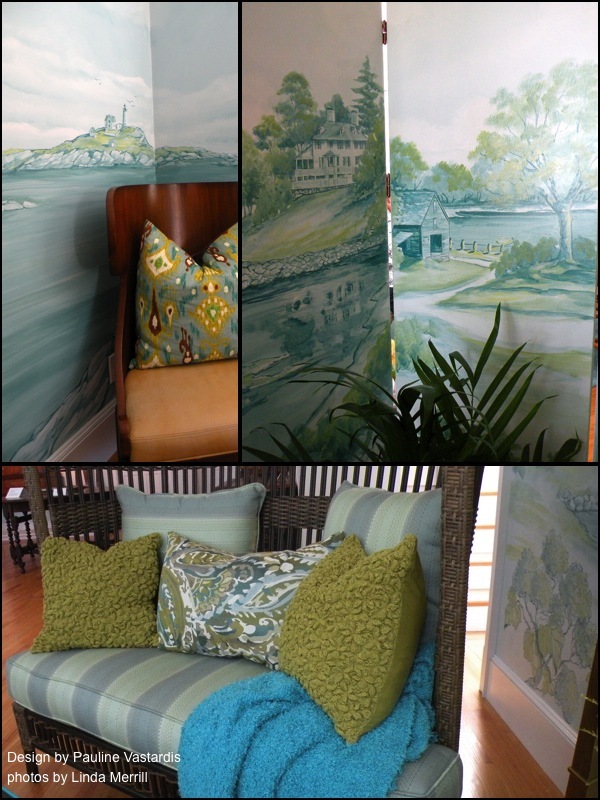 A small space was made very special when designer Pauline Vastardis brought in decorative painter Susan Marshal to create a custom wall mural that depicts the local Maine scenery and a screen (which will be auctioned off later on) depicting the various house museums which are part of the Museums of Old York. Pauline filled out the space, a woman’s retreat, with beautiful fabrics and vintage furnishings. 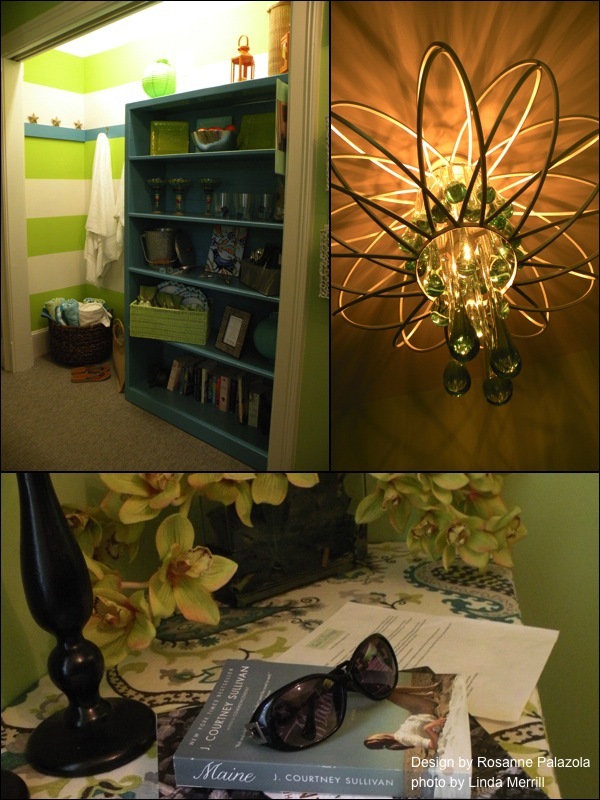 Blogger and designer Rosanne Palazola created the “Poolside Portal” as a kind of updated mudroom which stocks various items needed for poolside enjoyment such as books, glassware, etc. The ceiling fixture, from Lucia Lighting, is a kind of modern “onion” style with recycled glass drops. All of the rooms done by Rosanne, Katherine Hawkins and Yvonne Blacker were done individually and as a team they called Trio Designs where each took the lead on a space, but they also worked together on the details and coordination. Great job ladies! This final photo shows more of the grounds, which are really amazing. This is not only a great tour for interiors fans, but for gardeners as well. The mature landscaping is lush and really quite amazing. There are, of course, many other spaces which I’m not showing here. Don’t want to give it all away! Coastal Living magazine was shooting the master bedroom (by Patricia Finn) which is a feat of re-creation from the original space. This house is currently on the market and you can see the “before” photos here.You will be amazed at the changes these talented designers have brought to the house. The show house is going on through August 15th. Information here.